By the 3rd week of January, nearly 60% of New Year Resolutions have already been abandoned. We don’t want you to be one of these statistics. A common goal for the new year is to exercise, however time and focus are only two reasons that people will give up on this goal. Often people will give up on exercise because once they start exercising they start hurting. The neck pain, back pain, knee pain, shoulder pain “comes back.” The problem was always there and was typically never addressed or fully corrected. People will then give up on a healthy lifestyle choice, like exercising to be healthier, so that they don’t hurt. Once they do that they end up in a vicious cycle of frustration. They start off saying they are going to exercise, then they start hurting because they never got the neck pain, back pain, knee pain, etc. corrected, so they stop exercising, and they get frustrated and discouraged because they haven’t met their goal. Warm up – a 5-10min warm up prior to more vigorous exercise can prepare your brain and body for the activity ahead. A light jog, bike ride, elliptical, or walk, can get your blood pumping so that you are ready for the physical stress that you are about to put on your body. Stretch – perform light stretching so that your muscles, tendons, and ligaments are better able to function, and decrease your chance of injury. Ice – if you notice aches and pains ice the area for 20min with a towel between the skin and the ice. Perform this icing 3x/day. See a professional – If your aches and pains continue for 24-48hours don’t give up on your goals, seek professional help. Find someone that can help you correct your problem while helping you reach your goals and not fall into that vicious cycle of frustration. These are the same steps that are followed by professional athletes, collegiate athletes, all the way down to our pee-wee players. The reason is because these steps work as a foundation to build from. 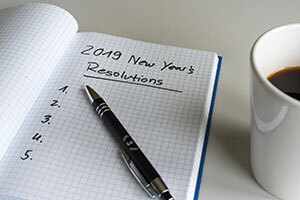 Follow these steps for the best success in starting your exercise program in 2019.